Kraftwerk (In English, "power plant") is an electronic band founded in 1970 in Düsseldorf, Germany. They pioneered electronic music in the 1970s and are considered one of the most important and influential bands of their genre -often described as 'the godfathers of electronic music". Ralf Hütter (b. 1946, Krefeld, Germany; organ) and woodwind student Florian Schneider-Esleben (b. 1947, Düsseldorf, Germany; woodwind) met while they were studying improvised music in Düsseldorf, Germany. The first album is called "Tone Float", with Ralf Hütter and Florian Schneider as members of the group Organisation. On "Tone Float", the line up consisted of Ralf on organ, Florian on violin and flute, Basil Hammoudi on vocals, Fred Monics on drums and Butch Hauf on bass. The LP features repetitive percussion and bass drum patterns embellished with guitar, flute, violin and organ. Sections of the music are clearly '60s influenced and have an almost eastern feeling with scratchy violin and bongos. "Tone Float" was the last time that Ralf and Florian would rely on unrestrained expression and improvisation. With Organisation being a democratic five piece band, it was difficult to develop a disciplined approach. Any comparison between "Tone Float" and the later Kraftwerk sound is hard to draw. Originally a krautrock group along the lines of Neu!, Can and Tangerine Dream Kraftwerk opted for a more minimalistic approach in their music. Which became increasingly synthesizer-driven as time went on. After disbanding Organisation, Ralf Hütter and Florian Schneider adopted the name Kraftwerk with Klaus Dinger and Thomas Lomann. The album "Kraftwerk" was recorded between July and August of 1970 in their new Düsseldorf studio. It was co-produced and engineered by Connie Plank (later to work with Ultravox and the Eurythmics) with the assistance of Klaus Löhmer. Plank did believe very strongly in the pioneering music of Kraftwerk and he helped with the recording process often for little or no remuneration. When released in late 1970 the LP sleeve was designed by Ralf and showcased their adopted trademark - the traffic cone. From the very opening notes of the LP it is evident that the duo had put much of the meandering uncertainties of "Tone Float" behind them arriving at a more disciplined form of music. Compared to "Tone Float", "Kraftwerk" was a considerable artistic success and they had managed to mix a blend of sounds giving an almost hallucinogenic effect. However the bleak, spartan music provoked little commercial response. With a successful album, the band's confidence had grown and they played more live concerts in Germany than before. The concerts were often advertised with a poster featuring the red and white traffic cone with a naked woman superimposed on it. This was done for promotional purposes. Which paved the way to critics supplying the reason why the traffic cone was displayed inverted on another release. Neat isn't it? These concerts featured the line-up from the LP and after a short while Thomas Homann left. They continued as a trio with Klaus Dinger and then the band were joined by Michael Rother (guitar) and Eberhardt Krahnemann (bass), a five piece line-up which was to only last for one session. When Krahnemann left the band he was amazingly followed by Ralf Hütter himself. For six months Florian, Rother and Dinger played music that bore a closer remembrance to Rother and Dinger's later work with Neu!. The trio recorded a 35 minute session at Connie Plank's studio which was never released. Ralf and Florian rejoined and released the "Kraftwerk 2" album. The LP was produced in just 7 days between 26th September and 1st October 1971. 1972 In this year the interest in UK for German music had grown enough for the two first LPs to appear as double LP on Philips' progressive Vertigo label. The LP appeared with a new sleeve depicting an oscillating blue electronic wave signal. The first two LPs were also re-released in Germany in 1975. After releasing a duo set ("Ralf & Florian", 1973), Wolfgang Flur (electronic drums) and Klaus Roeder (guitar/violin/keyboards) joined the group. "Autobahn", released 1974, marked Kraftwerk's breakthrough and established them as purveyors of hi-tech, computerized music. The title track, running at more than 22 minutes, was an attempt to relate the monotony and tedium of a long road journey. An edited version reached the Top 10 in the US and UK charts. In 1975, Roeder was replaced by Karl Bartos, who played on "Radioactivity" (1976), a concept album based on the sounds to be found on the airwaves. "Trans-Europe Express" in 1977 showed an increasing lack of human influence. 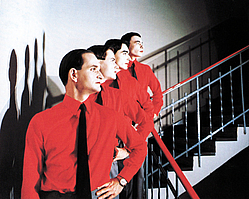 By the time of 1978's "The Man Machine" ("Die Mensch Maschine" for the German speaking audience), Kraftwerk had created their own unmistakable brand of "robot pop". The New Musical Express said of "The Man-Machine": 'It is the only completely successful visual/aural fusion rock has produced so far'. Kraftwerk spent three years building their own Kling Klang studios in the late 70s, complete with, inevitably, scores of computers. The single 'The Model', from The Man-Machine, gave the band a surprise hit when it topped the UK charts in 1982, and it led to a trio of hits, including 'Showroom Dummies' and 'Neon Lights'. 1981's "Computer World" ("Computerwelt") combined the use of the sequencer to create the sound now known as electro, inspiring the first producers in Detroit in creating techno, as well as innumerable other artists including Gary Numan, Depeche Mode, and New Order, among many others. This album had the theme of computers taking over the world in the future. It was a commercial success, spawning the hit 'Pocket Calculator' using a calculator as the main instrument. A fun song on which Ralf sang of how his calculator could play a tune,' by pressing down a special key it plays a little melody '. This song has become a live favourite, as all band members come to the front of the stage and allow the audience to play tunes on their ' calculators '. Another hit from this album was 'Computer Love'. For this album, the band embarked on the massive 'Computer World' world tour. It might be noted that "Martin Gore & David Gahan" (of Depeche Mode) attended one of the concerts at the 'Hammersmith Odeon. Concerts by Kraftwerk are a truly unique experience. The band members perform dressed exactly the same and each member has their own "workstation" to produce the music. Video screens are placed behind the band and there are videos on the screen to match the song they are playing. Kraftwerk also travels with robots and they are put on the stage in place of the band for the song "The Robots". The EP "Tour de France" was released in 1983. This song was featured in the film Breakdance and became the theme for the cycling event of the same name in 1983. "Electric Café", released 1986, was a disappointment. Hutter and Schneider have remained enigmatically quiet ever since Electric Cafe. In 1990 a frustrated Flur departed to be replaced by Fritz Hilpert (Flur later collaborated with Mouse on Mars under the name of Yamo). 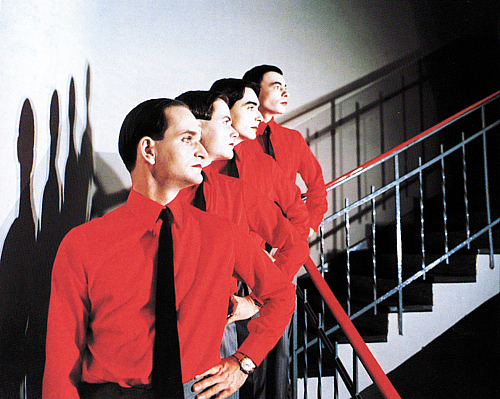 Kraftwerk's best known songs were collected together in 1991 on the double album The Mix aimed chiefly at the dance music market by EMI Records. 'I think our music has to do with emotions. Technology and emotion can join hands . . .' said Hutter in 1991. The single "Expo 2000" released 2000 came as a surprise for Kraftwerk fans. A brand new song, although low key, sparked hopes of a new album. However Kling-Klang remains silent. A video was released for this track, showing the band playing in wireframe suits, but no public appearances or interviews until 2003. when they released "Tour de France Soundtracks" Florian Schneider-Esleben officially left the band in January 2009, though news of his departure was reported as early as April 2008. His place will be taken over by Stefan Pfaffe. In total Kraftwerk's influence has been incalculable. Hundreds of artists today in nearly every electronica genre bear witness to their work. They are also wonderfully reclusive, giving their address as Duesseldorf HBF (railway station), but rarely giving interviews and making no media appearances. Subscribe to Kraftwerk RSS Feed to get latest lyrics and news updates. What do you think about Kraftwerk? Let us know in the comments below!